Meanwhile, Democrats let it be known they are likely to run a candidate. Atlanta Mayor Kasim Reed’s name was heard from several quarters as a possibility. 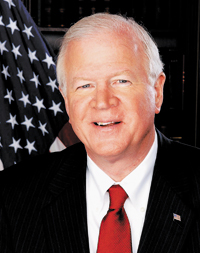 Reed has a high profile statewide – thanks, among other things, to his vocal support of Georgia ports. But he also has a race to win later this year for a second term as mayor, and he has indicated that’s what he will focus on. He also said he is confident he could have won re-election, that his health is good and he intends to serve out his current term. New UGA President: Provost and Senior Vice President for Academic Affairs Jere Morehead emerged as the lone finalist and will succeed Dr. Michael Adams as president of the University of Georgia. Morehead, a 1980 graduate of the UGA law school, has served the university as administrator and professor. He is the Meigs Professor of Legal Studies in the Terry College of Business, where he has been on he faculty since 1986. Chance Selection: State Sen. Ronnie Chance (R-Tyrone) has been named 2013 Legislator of the Year by Georgia Bio, in recognition of his support of the life sciences industry and university research in the 2012 session. Chance is the Senate majority leader. New State Chamber Head: Stephen S. Green, president and CEO of Morris Manning Martin & Green Consulting LLP, is the 2013 board chair of the Georgia Chamber of Com-merce. He is vice-chair and former chair of the Georgia Ports Authority and a former chair of the Savannah Area Chamber of Commerce. Attorney Ernest L. Greer of Greenberg Traurig is 2014 chair-elect. Car Tax Changes: Beginning March 1, motor vehicles titled in Georgia are subject to a one-time Title Ad Valorem Tax that replaces annual ad valorem and sales taxes, courtesy of HB 386 passed in 2012, according to a remind-er issued by Cobb County Tax Com-missioner Gail Downing. Vehicles purchased between Jan. 1, 2012, and Feb. 28, 2013, may opt in before the end of the year. Older vehicles will remain on the annual tax system. It’s likely there will be some tinkering to HB 386 during the current session to eliminate the so-called “double tax” on leased vehicles, which requires sales taxes paid both at the time a lease agreement is signed and throughout the period of the lease. New ARC Faces: Four new members on the board of the Atlanta Regional Commission include Chamblee Mayor Eric Clarkson and three county commission chairmen: Steve Brown, Fayette; Jeff Turner, Clayton; and Tommy Smith, Henry. The ARC is the planning and intra-governmental coordination agency for 10 metro Atlanta counties.